An 88th minute goal saw the Blues fall to a defeat to Athlone Town on the opening day of the SSE Airtricity League First Division. The match was delayed by 30 minutes due to floodlight failure, with the game kicking off at 8.15pm, and it was the Blues and Kenny McEvoy who were first to threaten; but the midfielder’s cross couldn’t find the head of O’Sullivan and before being cleared by by Athlone Town defender Kirlis Grigorov. 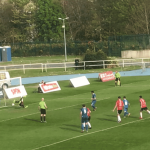 The Blues continued to press and Kenny Browne threatened next when he latched onto a Dean O’Halloran free kick but his left-footed strike was just wide of the Athlone Town goal. Home goalkeeper Igors Labuts was alert to the Blues attack minutes later after Browne looked to set O’Halloran away but the keeper got his hands on the ball to prevent the winger from getting a shot at goal. Labuts was called into action again midway through the half. Patrick McClean and O’Halloran linked up well for the latter to cross, but goalkeeper Labuts was alert and made a good save from Browne’s header. The Blues had a good chance three minutes into the second half. Midfielder Garry Comerford drilled the corner which found the head of McClean who helped the ball toward Puri, but Athlone keeper Labuts smothered the effort from close range. Shane O’Connor fired over before Mark O’Sullivan had a goal ruled out for offside. At the other end, Val Feeney had a great chance for Athlone after David Brookes did well down the left, but he shot narrowly over the crossbar. Dragog Srfijan went close for the Athlone as the game entered the final quarter, but his low strike drifted narrowly wide of the far post. But the Blues were to be undone in the final minutes. Defender Jake Evans tried to bring possession from defence but was dispossessed by Athlone’s Brookes before the ball fell to Colm Coss to fire a left-footed strike past McLoughlin from the edge of the area to give Athlone the three points. 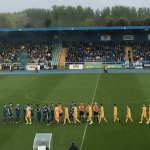 Waterford FC: Ian McLoughlin; Jake Evans, Kenny Browne, Patrick McClean, Shane O’Connor (Davy McDaid 82); Kenny McEvoy, Tom Smith, Garry Comerford, Dean O’Halloran (Derek Daly 62); Sander Puri; Mark O’Sullivan.